What makes a good story, and why do we love them so much? Do we love stories for the drama and the characters? Or is it about letting ourselves get sucked into the imaginary place the author creates? A good story allows us to enter into a new world in which we are changed and challenged by seeing life in a new way. That is the way Jesus told stories. 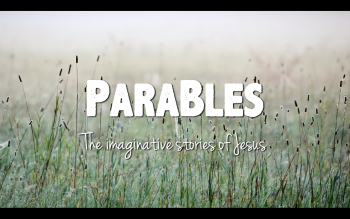 These imaginative stories are known as Jesus’ parables. During this series we will look at some of the parables Jesus told, with the hope that each of us will be challenged to ask more questions, be reminded of the truth of the Good News, and be provoked, refined, confronted, and hopefully – changed. We hope you can join us as we go on this journey together, and hear from God in a fresh way. It all starts this Sunday at 11 a.m. 4862 Broadway (1st floor, cafeteria).